The big names in baseball join ESPN Chicago's Talkin' Baseball! Talkin' Baseball not only covers the Cubs and White Sox, but all of MLB with expert analysis, interviews and your phone calls. 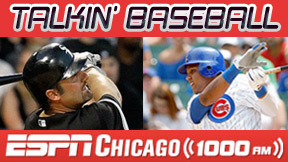 Join Fred Huebner for the best baseball talk show in Chicago -- Talkin' Baseball! Listen live Saturday mornings on ESPN 1000 and online at ESPNChicago.com! Diamondbacks hitting coach Don Baylor joined "Talkin' Baseball" on Saturday. Jesse Rogers brings you the latest Cubs news in the Cubs blog. Doug Padilla brings you the latest Sox news in the White Sox blog. ESPN's "Sweet Spot" by David Schoenfield has all of the major leagues covered. Download or stream Talkin' Baseball podcasts, posted every Saturday. Hit monstrous home runs and aim for the targets all over the park! Think you're clutch? Test your hitting skills in the bottom of the ninth.